A hall commemorates those who served in World War One. The hall was officially opened on the 15th October 1925 and has undergone alterations since its original erection. 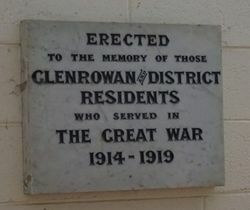 The official opening of the Glenrowan and district Memorial Hall is to take place on Thursday, 15th October, in the form of a grand ball, at which Parliamentary and district representatives wlll be present. This entertainment should be an outstanding event in the history of Glenrowan and district, and of particular interest to those who still do honor to the memory of those district residents who served as members of the Australian Imperial Forces. 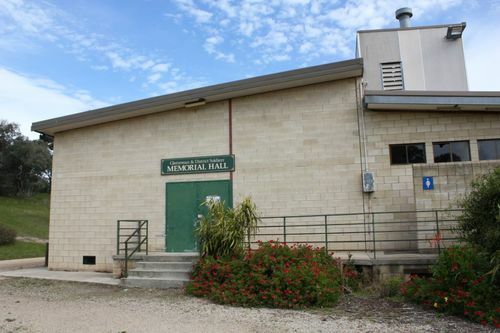 The hall itself will be an appropriate and useful memorial, indicating the unselfish spirit exhibited by those to whose memory it is erected. The committee has decided to spare no efforts in making the evening one to be long remembered. The services of a first class orchestra have been obtained, and a dainty set supper will be served. Souvenir programmes will be issued. For the convenience of non-dancers, the stage will he turned into a lounge. Benalla Standard (Vic), 22 September 1925.